I am revising my first novel, THE ROAD TO INDIGO, a cross between The Secret Life of Bees and To Kill a Mockingbird. It is the story of Maybelle Dupree, a Southern Louisiana traiteur, or healer, and Perry Rebecca Landry, an endangered teen-aged outsider, who discover that they are bonded by blood, secrets, and their innate ability to heal maladies. At Maybelle’s Indigo Plantation, they join forces to preserve the disappearing healing traditions of Cajun-Creoles, and they defy the social order of the Civil Rights-era Deep South at their own peril. I completed the novel in 2013. Recently, I mustered the courage to read it straight through for the first time and made notes in the margins. Working in the solitude and natural beauty of a friend’s house on Lake Quinault, I opened my laptop and the document holding my manuscript. I could see what I needed to do to improve the way the novel unfolds and I set about revising. I’m energized by the momentum building as I find the form that best serves the story. I also write feature stories and people profiles for the University of Puget Sound magazine, Arches. Occasionally, I’ll write a poem, which I love doing because it’s something I can start and finish in a matter of hours, not years. For starters, the novel is very place-specific. It’s set in the Cajun-Creole region of Southern Louisiana, west of New Orleans. Before I determined my setting, I’d already created and come to know my characters. One is Maybelle, a 70-year-old black woman who heals people using spiritual techniques and remedies derived from plants. I wanted an ethnically diverse setting for my 1960s-era story. Sitting in my living room in Tacoma, Washington, one evening looking at maps online I said, “Avery Island, Louisiana.” I’d never been to Louisiana and knew nothing about Avery Island. Through an ongoing string of providential connections, I learned about traditional healers of the region. They’re called traiteurs, a French word meaning treaters. I decided I had to go to Louisiana to try to talk with a traiteur, that is, if they’d be willing to talk with a stranger about their practices. All I knew is that traiteurs did exactly what my character Maybelle did to heal people. She lived in that region. She had to be a traiteur. So, I travelled to Louisiana for the first time ever in 2011 to learn first hand about the healing practices of Acadiana. Although THE ROAD TO INDIGO is a work of fiction, it’s important to me to represent cultural traditions portrayed through my characters as authentically as possible. I did talk with several traiteurs and natives of the region who enriched the story tremendously. In fact, I threw out several chapters I’d written and started fresh. I’ve also amassed a collection of regional literature and reference materials, including the Dictionary of Louisiana French and Secret Doctors: Ethnomedicine of African Americans by Wonda L. Fontenot. There are plenty of novels set in Acadiana and even a few novels with characters who are traiteurs, though those are rare and are, to my knowledge, written for young adult audiences. My novel also deals with healing from the standpoint of social justice. I love the question even though I wrestle with the answer. I suppose I’ve always been a bit of an outsider with a curiosity about what it means to belong, like my young character Perry. 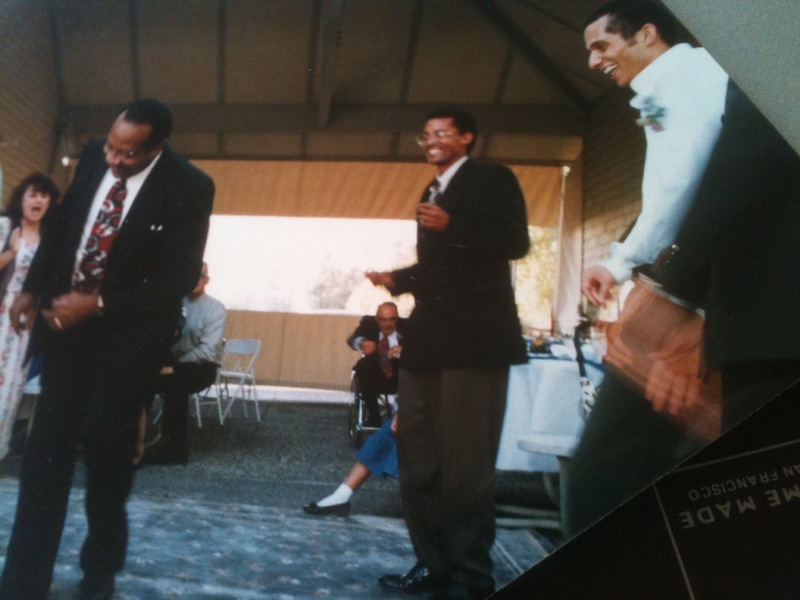 I come from a racially diverse family and have lived in communities where I didn’t speak the language I heard spoken. I struggled with whether or not THE ROAD TO INDIGO was my story to tell since I’m not of the culture or geographic region. Yet, it is a story that came to me as I sat down to write. With each step I took toward the story, doors opened and so did the story. In speaking with one traiteur who avoided me at first and who most resembles my character Maybelle, she said to me, “You were born with this story in you. Now you just need to sit down and write it.” As life as I knew it crumbled all around me, I sat down and wrote THE ROAD TO INDIGO. I’ll keep writing it until I’m satisfied it is ready to send out into the world. I write life, including parts of it that can only be intuited and that are often more real than what can be perceived by the five senses. During my lifetime, I’ve been diagnosed with two life-threatening illnesses. I’ve been healthy for seventeen years and counting. I believe that healing takes place in a multitude of ways, including through story itself. That belief has contributed to why I write what I write. I believe that there are stories that want to be told and that they choose the teller. Process? That’s not a word that flows through my fingers naturally. I’d say “organic” best describes my novel-writing process. I was forced by an adviser to write a chapter-by-chapter outline and synopsis of my novel. Mostly, I let the story itself inform me what’s next. Now that I know the whole shape of it, I have identified certain objectives I want to accomplish. My writing feels more strategic now that I’m revising, making structural shifts, and layering in details. Three novelists have given me feedback on my first draft, which I’m considering as I revise. 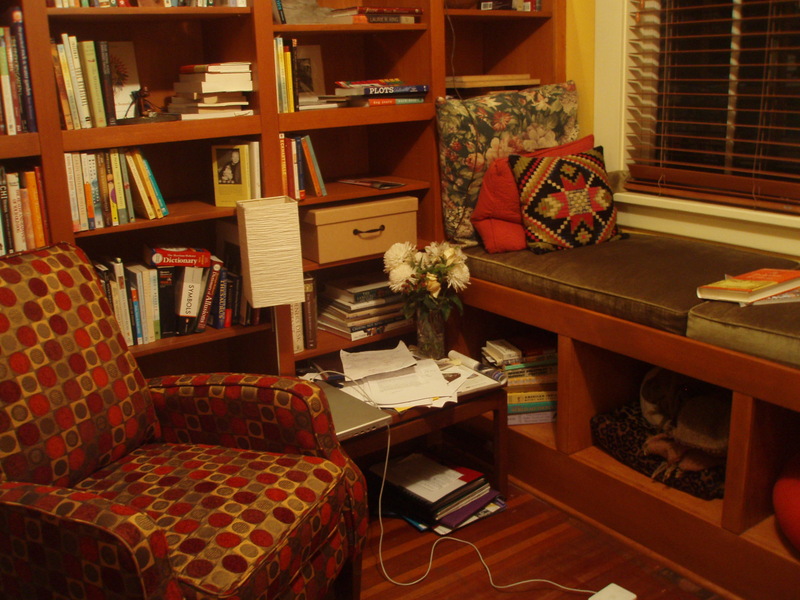 If I’m on deadline I go to my upstairs writing room, sit at the fold-down desk, and write on my computer. I wrote early chapters in pencil on large, lined tablets. Somehow using the pencil seemed less serious and let me sneak up on the scenes playing in my head and get them on paper. I wrote this way sitting by a pool in California. 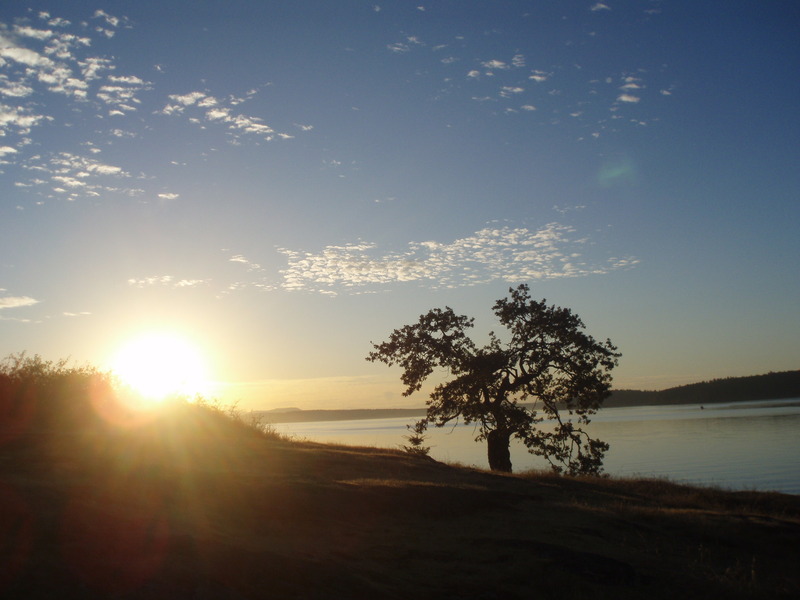 I wrote major passages during writing fellowships at the Whiteley Center on San Juan Island. For many months I met a writing partner at my dining room table and wrote Thursday mornings for two hours. I’m reading about three novels at any given time and studying how they’re made. I participate in writers’ conferences and classes. Serving as assistant fiction editor of Soundings literary journal helps me discern what works and why in a story. How do I get the writing done? It gets done when I sit down and write. I don’t talk about it a lot because it dissipates the energy I could use for writing. The Writing Process Blog Tour continues next week with the wonderful author and teacher MARGARET GIBSON SIMON. She lives on the Bayou Teche in New Iberia, Louisiana. She’s the author of two books, BLESSEN, a young readers novel, and ILLUMINATE, a book of poetry inspired by drawings by her father, John Gibson. Margaret is passionate about teaching, poetry, family, and dancing with her husband of nearly 30 years. Margaret blogs about life on the bayou at http://reflectionsontheteche.wordpress.com In fact, she wrote a poem in May 2013 titled The Road to Indigo, for Sandra Sarr, which you can hear her read on her blog. Also blog touring this week is the deeply talented and insightful writer and spiritual teacher TRIA REED. In order to create original written materials for spiritual performances and workshops, Tria left behind her academically trained writing voice. She’s offered one-woman shows (“My Name is Love” and “In the Beginning God Danced”) throughout Western Washington and in Northern and Southern California. Her website (www.spontaneousmeditation.org) showcases her non-fiction writing and several short poems. After years of preparatory research, Tria’s novel, THE WAY OF THE RIVER: A SPIRITUAL ALLEGORY, is well underway. Soon I will return to the lush landscape where my novel is set. I’m in my writing room writing. It’s 16 degrees outside and I’ve been nursing my furnace through one more season, please, using notes and a metal tool. My life is rich and uncertain. I live a writing life. Rich. I am on my own after a long marriage. Uncertain. I have meaningful work as a teaching assistant for a course with my graduate school, as assistant fiction editor of a literary journal, as a freelance writer for a university magazine, as a promoter of friends’ artistic works, as a board member for two non-profits. Rich. Only one of these gigs pays. Uncertain. And there’s my novel to revise. Others, including an agent, are waiting to read the manuscript. What is certain is that my whole being is recalibrating. I can almost hear the clicking and whirring, like a deck of cards shuffling inside or like the old furnace in the basement blowing, crackling, and blessedly igniting with a roar. I’m in my writing room this morning thinking, my dog giving up his pleading for play and slipping into a soft snore. Russell Edson’s The Tunnel is in my lap. I haven’t picked up the book since I took the class as a student four years ago. I’ve never been willing to sell or recycle my textbooks, though I’m becoming more discerning about what I keep. Edson is like an edgy old friend I put on a shelf. Today, I’m reading his “Waiting for the Signal Man” and considering the grad students’ and teacher’s take on the prose poem, its imagery, ideas, and techniques. A student observes that the poem folds into and out of itself and I offer thoughts about why. After a long silence here and elsewhere, inspiration sparks and a few words release. Awash in grey, I dream of southern Louisiana and what I will bring when I return this spring. The Road to Indigo calls. 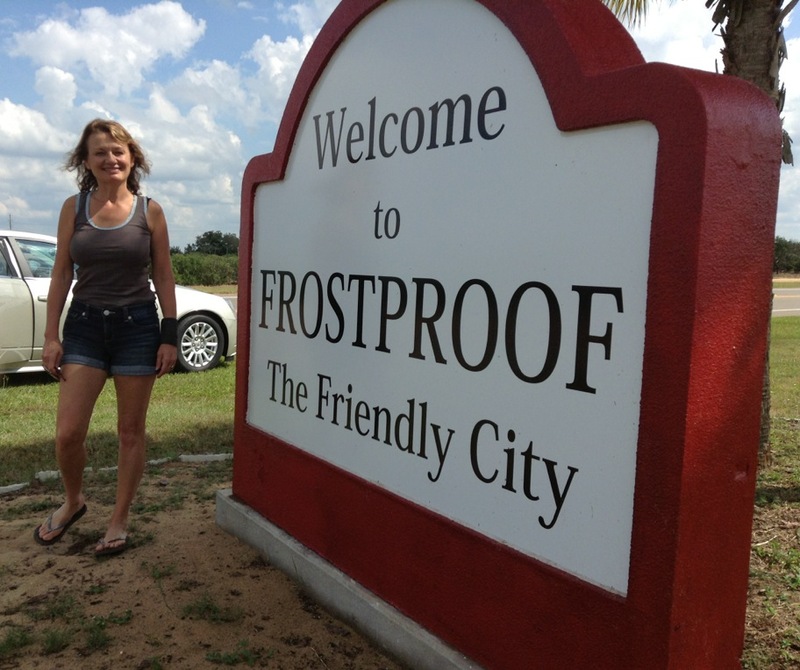 While in Florida this week, I decided to take a spontaneous side trip to Frostproof to see for the first time the lake-rimmed farm town where my stepfather, Wallace Reese, came of age. I grew up hearing his stories about Frostproof. When I discovered I was only forty minutes away, I had to go. Wallace (No Middle Initial) Reese was the thirteenth of thirteen children born to Mrs. Ever Reese Troup. By time Wallace was born, I suppose she’d grown tired of naming children and so her youngest got only one. He didn’t mind. He went on to make a name for himself anyway. Much of Florida’s terrain is flat, but the two-lane road, Scenic Highway 17, that leads into Frostproof rolls gently through sloping orange groves and past natural lakes. Its central business district, a crossroads with a bank, vintage car showroom, gas station-turned-bistro, and feed store at its core, looks much the same as the one Wallace walked in the 1940s and 50s. But looks tell only part of a story. I wonder if much has changed concerning race relations since Wallace’s time there. I wonder if Wallace, a black person, could walk freely into any neighborhood or business in Frostproof and be treated with respect–both then and now. Apparently, he grew up in segregated conditions. According to a May 2004 article in The Ledger, the local daily newspaper, “The original lawsuit to end segregation in Polk County was filed in fall 1963, almost a decade after the Brown decision. A federal court ordered Polk County to end its “biracial” school system and desegregate in 1965. Integration began during the 1965-1966 school year and mandatory desegregation occurred during the 1969-1970 school year. The district remained under a federal court desegregation order until March 2000, when it was granted “unitary status,” meaning it no longer operates a segregated school system.” Wallace graduated from high school in 1959. Apparently, he attended segregated schools throughout his entire education in Frostproof. I wondered if he attended the large and quite beautiful Spanish Mediterranean school building we drove past. When he was very young, his mother would take him on the bus with her to work. She was a maid for well-to-do folks, and Wallace grew up seeing and appreciating nice things. 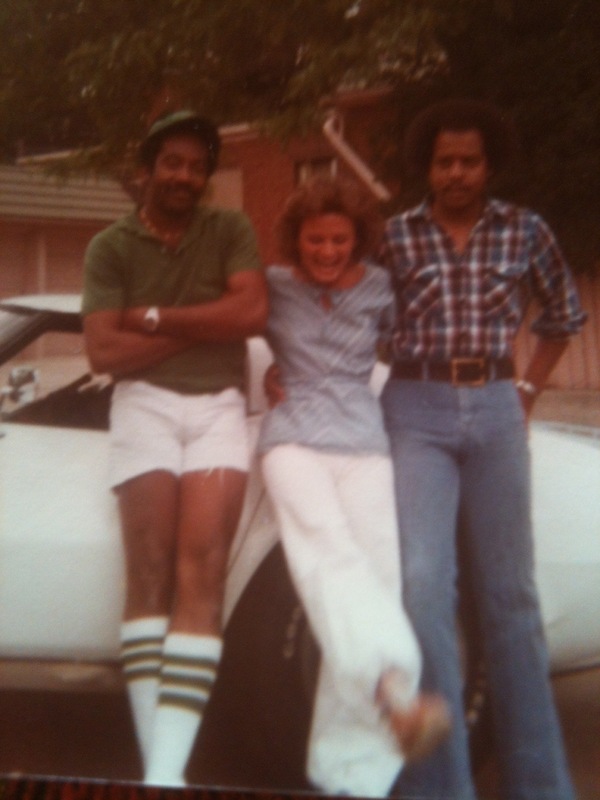 He developed exquisite taste in fashion, home décor, and automobiles and he loved literature, travel, and a good debate. And Scotch. He liked to tell of working in Frostproof’s orange groves as a boy. His boss handed him a tool called a scuffle hoe and said, “Boy, all you got to do is keep this thing moving and make sure you don’t stop ‘til the sun goes down.” Laughing hard, Wallace made a push-pull motion to demonstrate how the hoe worked. He said it didn’t matter how you used it, its triangular blade would scrape weeds from beneath the trees as long as you kept it moving. He laughed at the absurd tedium, but the truth is that central Florida’s blistering heat could sap the life right out of a person. Not Wallace. After Wallace graduated from high school, he packed a suitcase, boarded a bus, and showed up at Florida A & M University. He walked into a campus administrator’s office and said, “I’m here.” The woman at the desk said, “I’m sorry. Your name doesn’t appear on our roster of admitted students.” No one ever told him he needed to apply to college. The woman looked him over and said, “Come with me.” She took him to the dean of admission’s office and explained the situation. The dean said, “Son, you look ambitious. I’m going to give you a chance.” He handed Wallace a college-entrance exam and a pencil. The dean admitted him that same day. Four years later, Wallace graduated with a bachelor’s degree in psychology. Far from the fields of Frostproof, he went on to a successful career with the Office of Economic Opportunity, the Department of Health, Education and Welfare, and other agencies. He provided a home for our family and an environment for learning, creating, and laughing. Today, October 25, is Wallace’s birthday. He would’ve been 72. I’m baking a German chocolate cake, his favorite, and singing off-key like he used to while listening to Isaac Hayes, Cannonball Adderly, and Nancy Wilson on his ’60s reel-to-reel. Wallace’s stories of Frostproof and beyond planted a seed of imagination that, no doubt, helped inform my novel, The Road to Indigo. As a fiction writer, I’m in the minority at Friday Harbor Labs, a marine biology field station of the University of Washington on San Juan Island. I’ve been fortunate to come here since 2007 as a Whiteley Fellow to work on a book that eventually evolved into a novel. Today, I ventured outside my studio and made an important discovery in the natural world. My first year here, I befriended an oak–a garry oak, quercus garryana, to be precise–who informed me her name was Matilda. 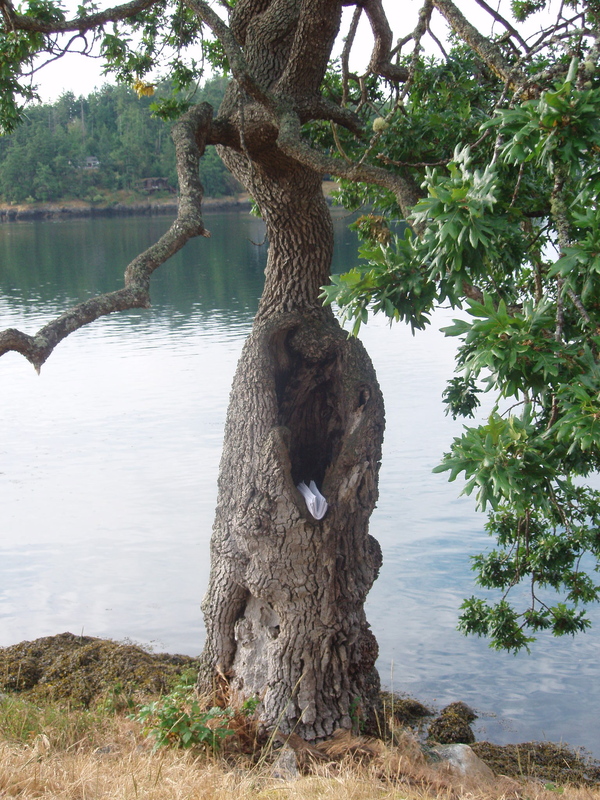 Growing out of rock at the edge of a wind battered island, Matilda’s trunk is hollowed out. Rearranged by breast cancer, I feel an affinity for this survivor tree. I can look right down into her empty core. Yet, there she stands, glossy green leaves sprouting each spring from brittle branches. From a distance, she looks like a Spanish flamenco dancer, skirt swirling as she turns. Close up, the iconic oak appears ravaged by harsh conditions and time. Several years ago, I found some dried up acorns in the shade of her. My daughter and I planted three of them, but not one had taken hold when I returned the following year. Then, a few years later, I found a tiny sapling beneath her! 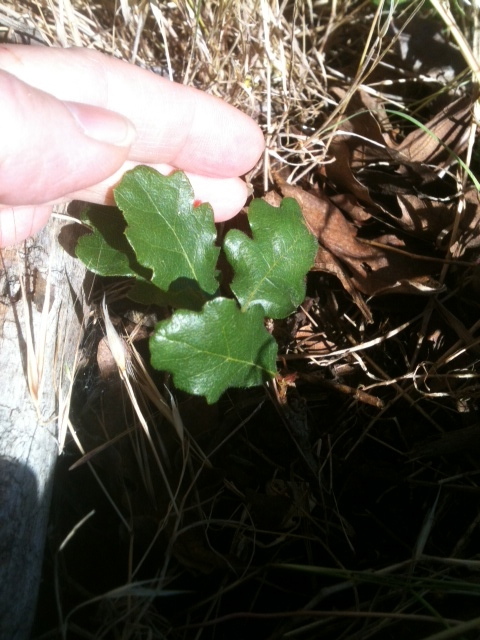 Old Matilda had produced a baby oak! I showed it to two FHL staffers, who I’d asked to look after it. They politely indulged my enthusiasm. Before I left, I bought a cage at the hardware store and placed it around it to prevent deer trampling and munching. When I returned in 2012, the cage remained but the sapling didn’t. Nature had run its course, I figured. I decided I’d stop looking and hoping. Today, I walked out to Matilda on an afternoon break, picking my way down the rocky terrain overlooking the docks and tidal waterway. Clasping a branch, I greeted her and told her, “I finished my novel. I’m here to make it better to get it published. My marriage is ending. I’m here to let go.” And, as I told Matilda what was growing, I looked down at my feet and there were four glossy oak leaves sprouting from a stem rooted in rock. Matilda made a new baby. The road to Indigo looks the same today as it does in the black-and-white photographs hanging in the Sugar House Medicine Room from when Miss Emily and her family lived here. I’ve studied the photographs and the trees lining the allee since I first came here nearly three years ago. One is my favorite. It’s called the Survivor Oak because the tree got ripped out to its roots in a hurricane during Rebecca’s time. But new shoots grew out of the Survivor tree’s knobby grey roots and the old oak filled out in all directions, wider than Indigo’s Great Hall and library combined, mightier than ever. You’re in for another treat when you read Bren Carver and The Next Big Thing interview about her novel in progress. Enjoy!